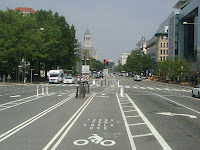 Mike Goodno, Bicycle Program Specialist within the Policy, Planning and Sustainability Administration of the District Department of Transportation (DDOT) would like to know what bicyclists think about the proposal to remove the flexible protective white posts (safety bollards) near the ends of each intersection along the bicycling lanes in the center of Pennsylvania Avenue during snow season. 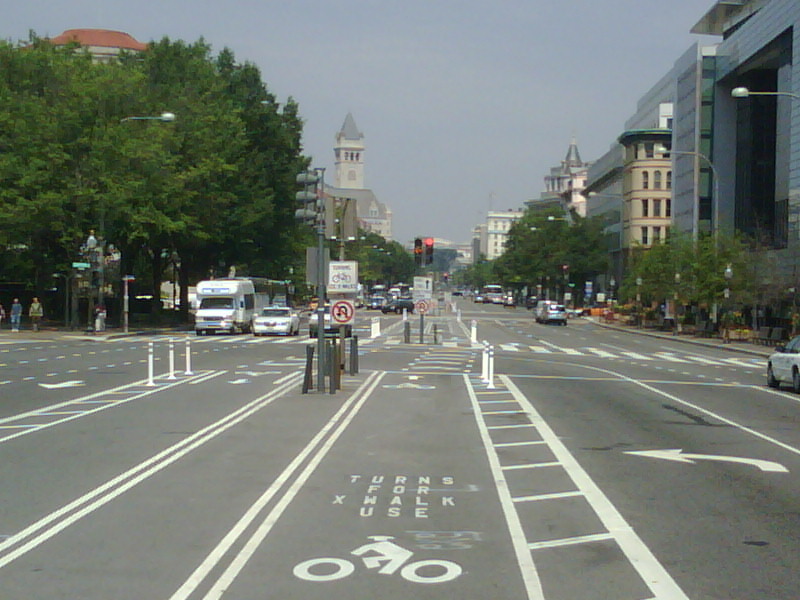 DDOT is planning a strategy to clear the bike lanes on Pennsylvania Avenue because the bollards ensure that cars do not encroach into the bike lanes, especially when making left turns. This information my also be considered useful as for other bike lanes and cycletracks. ...with the flexible posts and the center traffic lights, there is not enough space for a snowplow. We are considering removing the posts within the next few weeks and re-installing them in the spring. This would allow for the snowplow to clear the bike lanes while plowing the adjacent travel lanes. But, the trade-off is that there is no longer a physical barrier between the bikes and cars. Pennsylvania Avenue is a national highway system route, which are plowed by a specific team with larger plows. The other alternative is to keep the flexible posts, and plow each bike lane up that point. The drawback is that this would require returning later with another crew to clear the intersection area between the flexible posts. It’s likely that it may take 24 to 48 hours before this second plowing would occur. BAC appreciates what you think. Should DDOT remove of safety bollards for snow removal or keep them there and send a second plow crew to remove the snow that was initially missed? Please feel free to comment below or use the poll to the right. BAC will communicate what you say to DDOT. Update: Greater Greater Washington also asks about this issue with several comments from its readers.